Let's finish off those favorites from last year so that we can get to some new stuff soon! September: August and September were good stamping months for me. I guess I must stamp better when I'm feeling sad? I had quite a few cards during these months that I really like. 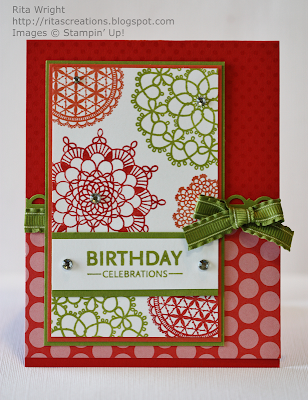 This next card was one I made for a Freshly Made Sketches challenge. 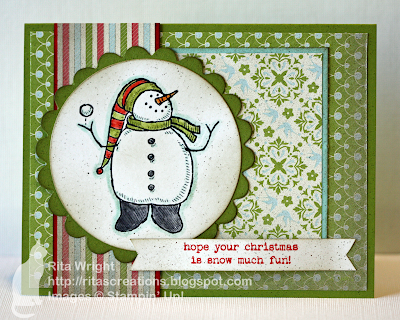 I love the colors so much and the snowmen from Snow Much Fun are some of my absolute favorite stamps! October: My other favorite Christmas stamp set and one I just might cry about in a few days when the Mini expires is Bright Hopes. My favorite card for this month uses it and I love it! It was another Freshly Made Sketches card that turned out way better than I could have hoped. November: This card was actually a card I made for a class. I love the colors; I think purple and green look gorgeous together! It was actually inspired by a card from the Idea Book and Catalog. If you ever need a bit of inspiration, that's a great place to look! December: I didn't find much time to stamp in December, but I did make one card that I adore. Again, it is using the chubby snowman from Snow Much Fun. I combined him with some of the new designer paper that will be available later this month for free during Sale-A-Bration! 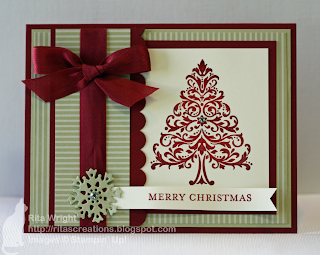 I wasn't sure about a distressed Christmas card, but I love it! I hope you enjoyed my look back! I hope this year will be filled with a lot of good surprises and much happiness! Happy New Year! Wow Rita, they are all wonderful but I do love the one you made for my birthday hop! Definitely worth a million or even more. That birthday hop was so special, it STILL makes me feel happy! Loved your journey Rita. Such wonderful cards and inspiration! Hope 2012 is just as creative and wonderful for you! Happy New Year. I'm with you, that Snow Much Fun set is just too cute and your December card just makes me smile so big. The card is just so fun and colorful! I think its sad that people feel the need to make claim on cards they didnt do, but I can certainly see why someone would wish they had come up with that gorgeous birthday card, WOW! 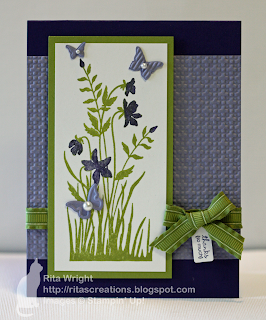 You made so many beautiful cards last year Rita. And all those design teams you've been asked to be on too, you should feel very proud of your achievements. 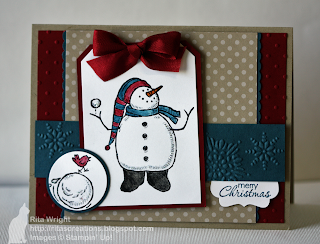 If I had to pick favourites, I would have to go with your snowman cards, they're all gorgeous!